I have worshiped plenty of false idols in my lifetime. Some of my favorites have been the false idols of Netflix, cell phone (iPhone kicked up my worship a few notches), Old Navy (don't judge me! ), computer (facebook anyone? ), and back in my teenage years - boys. My false idols are not unlike the false idols you worship on occasion. I know the leaders of the LDS Church and sometimes even our parents have been pretty good steering us away from false idols, but the biggest, ugliest, and most tempting idol worship is one I'm sure at least 99% of us are guilty of worshipping over and over at some point in life. I have had little to no help from anyone in quitting this most fatal idol I worship. Recently my wife and I had guests over for dinner. Amidst our pleasantries, one of them voiced her displeasure with a certain recent Supreme Court ruling. She opined that America had strayed too far from the vision of its founders, which is a common refrain among conservatively-inclined Americans and civil libertarians alike. I'm no expert on the matter, but I'm a reasonably-informed amateur and a fairly astute historical thinker; plus, as luck has it I've been reading Gordon S. Wood's "Empire of Liberty: A History of the Early Republic, 1789-1815," so America's founding has been on my mind. 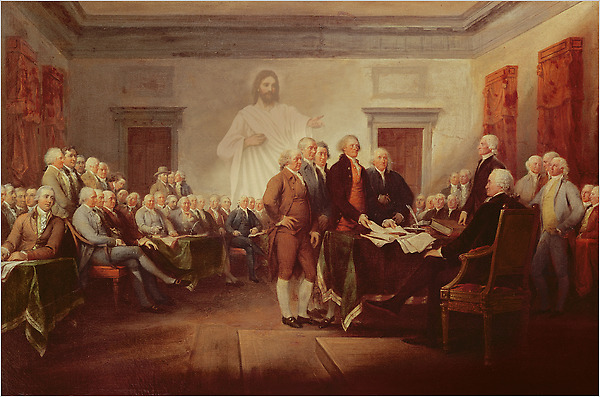 I started thinking...what if our country did live by the values held by the founders? In Foundersland, powdered wigs wear you!